My last post was about the Waitangi shipwreck at Patea. It had been covered up by black sand for many years and then the wind exposed it for a while, I have photos from 2010 and 2014. 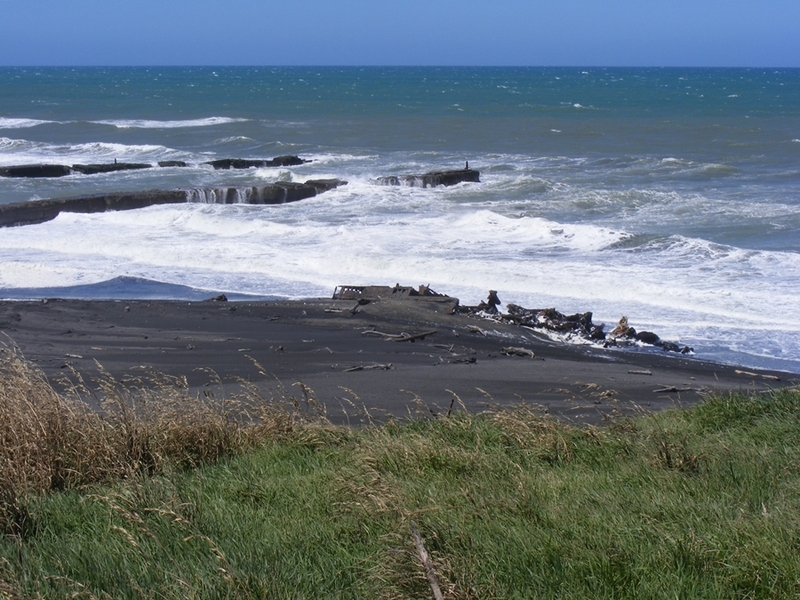 Well, I made it back to Patea Beach today to see if it was still visible. The shape of the beach had shifted and you wouldn't even know that there was a shipwreck on the beach at all. That's interesting that it disappears . Shows how powerful water and wind can be in such a short time. Like a mystery that is often elusive among other things that are often predictable. Gives one something amazing to always look forward to in their lifetime. There is a beach near where friends live at Tolsta on Lewis in the Western Isles, where the sand can be there one day and none the next. How extraordinary! I can't say I've ever heard of a disappearing-reappearing-disappearing shipwreck before. It sounds likes something that would make an interesting plot feature in a movie thriller. It is very interesting how the beaches change, there must be a huge movement of sand at that beach. Wow is it still there underneath? That's amazing, how fascinating. To be covered in black sand seems perfect. Looks chilly out your way!